2018's Wizard of Oz began in Toronto’s Ossington Village and along with pop songs, dances and a fractured storyline, some important subjects were addressed: global warming (the tornado), bullying (Dorothy sticking up for her pals when confronted by Lion’s bluster), and a moral undercurrent that’s missing in today’s political unrest. In 2017, we welcomed the return of Dan Chameroy’s beloved Plumbum, while everyone’s favourite Christmas curmudgeon Ebenezer Scrooge discarded his Humbug credo and pushed his big plans to own the holiday season. With Sleeping Beauty in 2016, the show had a slightly different slant in the evil department. Hilary Farr, star of HGTV’s Love It Or List It, brought glamour to her nastiness while re-designing DreamLand. 2015 marked our 20th anniversary at the gorgeous Elgin theatre. What better way to celebrate this landmark production than with a brand new version of the family musical that never grew up… Peter Pan. 2014’s Cinderella pitted Danielle Wade’s feisty heroine against her evil stepmother Revolta Bulldoza, while Dan Chameroy’s Plumbum and Eddie Glen’s Buttons filled the stage with Hypno Chips while the rest of the cast wore protective headgear. The Little Mermaid was a huge hit with audiences and critics alike. Gorgeous Chilina Kennedy and feisty Lana Carillo were voted best actress and best-supporting actress in a musical by the Toronto theatre critics. 2012 saw Stratford heart throb Graham Abbey as the debonair 007 join forces with Melissa O’Neil’s sensational Snow White to bring down yours truly as the enchantingly evil Stepmother. Melissa is currently enjoying an extended run on Broadway in a new production of Les Miserables. The 2011 production of The Wizard of Oz was a world premiere of our version of the beloved story. 2010’s Beauty and the Beast was populated with animal pop stars, namely Lady Baa Baa and Buskin’ Beaver, while 2009’s Robin Hood was forested with EnvironMENTAL themes and the 2008 production of Cinderella won rave reviews from both the public and the press. The 2007 production of Peter Pan starred ice skating legend Kurt Browning, who proved himself as masterful on a live theatre stage as he is on a frozen surface. Over the years at Yonge and Queen streets, the Elgin witnessed two other Robin Hoods… the 1996 production memorable for re-uniting National Ballet of Canada gold dust twins Karen Kain and Frank Augustyn, and the 2002 production giving Rex Harrington his musical theatre debut; one Jack and the Beanstalk in 1997 which allowed Heath Lamberts to wreak havocand the Beanstalk in 1997 which allowed Heath Lamberts to wreak havoc as Jack’s mother Widow Trott; two Snow Whites… the 2001 version showcasing Stratford leading man Graham Abbey’s deft comic abilities as witness his Dora Award that year, and the 2005 very fractured take on the seven denizens of the little cottage in the forest being a boy band featuring three Canadian Idols and fronted by Glass Tiger’s Alan Frew, with the entire show peppered with Sean Cullen’s extraordinary ad libs. There was an earlier Peter Pan in 2000 featuring Sheila McCarthy in a role she was born to play; two Cinderellas with the 1999 version putting Juan Chioran in a dress which whet his appetite for a return to couture in his hilarious turn in The Producers, while the 2003 production featured the ageless Don Harron and was a happy diversion for Erin Davis between gigs at CHFI. Of the three Aladdins, the 1998 production introduced the wonderful Ernie Coombs to the wacky world of audience participation. “Mr. Dressup” appeared in two more productions and we continue to miss his joyous spirit. Our 2004 Aladdin took a magic carpet ride to a hipper place with a deliciously anachronistic script. 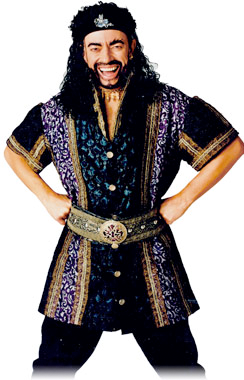 WWF superstar Bret “Hitman” Hart took a courageous leap out of the wrestling ring and onto the Elgin stage for what proved to be a memorable theatrical debut as the Genie of the Lamp. The success of that production caught the attention of Clear Channel Entertainment and under their Live Nation banner, Aladdin 2006 visited seven Canadian cities in November/December, with the Elgin Theatre as part of the itinerary. I’m very proud of our productions for many reasons, not least of which is the introduction of live theatre to thousands of gleeful children, while their parents enjoy the topical humour and irreverent ad libs. My gratitude is immeasurable for the many corporate sponsors who believe in these family musicals and support our vision. The chance to work with this country’s finest performers is a constant inspiration to me, and my appreciation of you, the audience, for your raucous participation, is boundless.